You can delete a volume(s) from the project database. 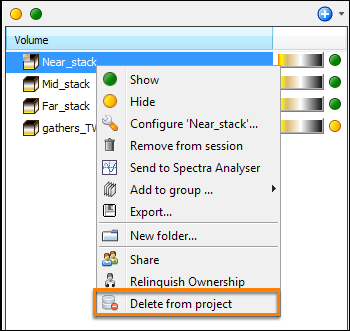 In this feature, you can choose to remove a volume(s) from the project database but keep the volume files in the disk so that you could re-import them when needed, or entirely delete the volume files from the disk. Note: When deleting volumes from Insight, the data is not removed until the session is saved. Select a volume that you want to delete. Press Ctrl and click multiple volumes if you want to select multiple volumes. Right-click the selected volume, and click Delete 'volume' from project. The Delete Products window will be displayed. Deleting a volume will affect all the files using that volume. Select the Delete associated data files check box to also delete all the data files associated with the volume. If you are sure about deleting the volume and data files from the disk, click Yes. If you want to delete the volume from the database but keep the data files, click No. To not do anything, click Cancel. Note: If you click Yes, the files will be deleted from the disk after you have saved the current session.